sFLC analysis provides an efficient diagnostic screen in combination with immunofixation of serum and urine. Baseline sFLC measurements provide important prognostic information. sFLCs are usually the most effective marker for evaluating the early effects of chemotherapy. sFLC concentrations during follow-up provide prognostic information on overall survival and organ responses. sFLCs increase during renal failure, independently of light chain synthesis. Figure 28.1. (A) AL amyloidosis showing formation of amyloid fibrils from FLC domains. (B) Classic facial features with periorbital purpura. Figure 28.2. (A) AL amyloidosis in the heart showing thickening of the left ventricular walls leading to heart failure. (B) AL amyloidosis showing macroglossia that occurs in 20% of patients. Primary systemic, or light-chain amyloidosis (AL) is a protein conformation disorder characterised by the accumulation of monoclonal free light chains (FLCs) or their fragments, as extracellular, insoluble amyloid fibrils that cause functional and structural organ damage (Figure 28.1A) . Typically, a slowly growing clone of plasma cells secrete the monoclonal FLCs, which are more often of the λ subtype (κ to λ frequency: 1:3) . Unlike multiple myeloma (MM), the morbidity and mortality associated with AL amyloidosis are due to the accumulation of FLC-derived amyloid fibrils, and not directly due to the proliferation of monoclonal plasma cells. 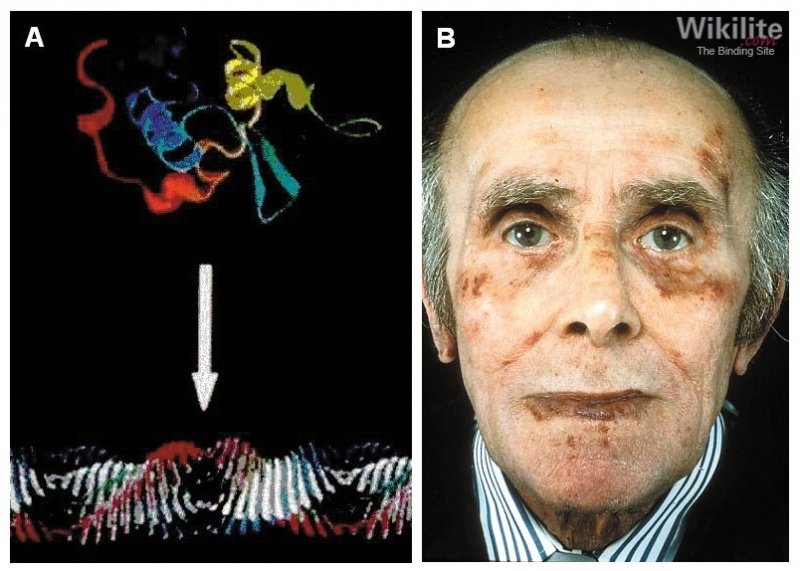 As amyloid deposits can be formed by a range of proteins other than immunoglobulin light chains, the diagnosis of amyloidosis should be based initially on tissue biopsy, followed by confirmation of the amyloid type and extent of organ involvement . Amyloid deposits in tissue biopsies stain with Congo red and produce pathognomonic red-green birefringence under polarised light. Immunohistochemical staining of tissue biopsies is frequently not diagnostic in AL amyloidosis, but is useful in confirming or excluding other amyloid types, such as the AA type (characterised by deposition of serum amyloid A protein) . DNA analysis can also be used to distinguish AL amyloidosis from hereditary forms of amyloid, which may coexist with monoclonal gammopathy of undetermined significance (MGUS) . The critical importance of identifying the amyloid type and the analytical tools available are described in a recent review of amyloid diagnosis . AL amyloid fibrils are formed from the N-terminal fragment of a monoclonal FLC, and comprise the variable region and part of the constant region. The ability to form amyloid fibrils appears to be related to the structural characteristics of a particular variable region; LV6-57, LV3-01 and LV2-14 genes and the KV1 family (particularly KV1-33) account for around half of the light chain variable region (IGVL) gene repertoire in systemic AL amyloidosis . Some variants of these gene segments have a high frequency of light chain N-glycosylation, which has been suggested to confer an increased risk of amyloid fibril formation . Using mass spectrometry, Kumar et al. identified N-glycosylation on light chain molecules in 33% of κ and 10% of λ AL patients, compared to <5% among non-AL patients and Kourelis et al. demonstrated that glycosylated light chains were present for years prior to the onset of symptoms. AL amyloidosis affects multiple organs, most frequently the kidney (74%), heart (60%), liver (27%), peripheral nervous system (22%) and autonomic nervous system (18%), although other organs may also be involved (Figures 28.1B, 28.2A and 28.2B) . A recent poster from the Amyloid Research Consortium  summarised their recommendations to improve the diagnosis of cardiac amyloidosis. Of particular note, they state that FLC analysis should be performed in all patients with heart failure (with a particular focus on concentric hypertrophy, NYHA I-II, or both) to facilitate early and accurate diagnosis of AL amyloidosis. The monoclonal FLC type influences the spectrum of organ involvement: κ-type AL typically affects the gastrointestinal tract and liver, whereas nephrotic-range proteinuria is observed in a higher proportion of λ-type AL patients . The tissue distribution may be related to structural characteristics of individual FLCs. For example, patients with the LV6-57 IGVL gene are more likely to have renal involvement . The median survival of patients with AL amyloidosis is similar for κ and λ patients, and ranges from 12 to 18 months in different published series . It is largely dependent on the spectrum and severity of organ involvement, particularly cardiac involvement . Whilst survival in AL amyloidosis has improved over the past decade with the introduction of several new therapeutic options, the 1-year mortality remains high at 43% . AL amyloidosis is 5 times less common than MM and affects slightly more men than women . The age-adjusted incidence of AL amyloidosis in the United States is estimated to be between 9.7 and 14.0 per million per year , which is equivalent to approximately 600 new cases per year in the UK . In an audit of 800 UK patients with AL amyloidosis, 66% were aged between 50 and 70 years of age at diagnosis, and 4% were aged less than 40 years . AL amyloidosis co-exists with MM in approximately 10 - 15% of patients, and more rarely with Waldenstrӧm’s macroglobulinaemia and other lymphoid malignancies (Chapters 32 and 31) . In a recent review of 1255 AL amyloidosis patients , the presence of CRAB criteria (hypercalcaemia, renal failure, anaemia and lytic bone lesions) or >10% bone marrow plasma cell infiltration was found to identify patients with a similarly poor prognosis. The authors suggested that both these patient groups should be considered together as having AL amyloidosis with MM. As for MM, MGUS is a precursor condition for AL amyloidosis (Section 13.3). In a study of archived sera from 20 American military personnel, who went on to develop AL amyloidosis; 100% of pre-diagnostic sera had a detectable monoclonal gammopathy 4 years prior to diagnosis and serum FLC (sFLC) levels were also observed to rise in the years before diagnosis of AL amyloidosis . 15. Kumar S, Murray D, Dasari S, Milani P, Barnidge D, Madden B, et al. Assay to rapidly screen for immunoglobulin light chain glycosylation: A potential path to earlier al diagnosis for a subset of patients. Leukemia 2018.